Plantar fasciitis typically presents as pain in the heel (mostly on the inside fron of the heel) or in the arch foot. The classic description from patients is that the pain is worst when first getting out of the bed in the morning and then eases when walking a few steps. However, once up and about the issue returns when getting up to walk when sitting down. It commonly presents in adults and is often related to stesses and strains from activity. Through time the plantar fascia becomes injured through wear and tear and eventually leads to what some people feel is an extremely debilitating heel pain or arch pain. The plantar fascia is like a huge elastic band running from your heel bone (calcaneus) along the bottom of your foot and up to your toes. The plantar fascia is one of the main stabilising structures in the foot when walking or running. Biomechanical issues put extra stress on the plantar fascia and through time can become inflamed and painful. Plantar fasciitis is extremely common, and effects a large percentage of the population at some point in their lives. In extreme cases plantar fasciitis can develop and become more stubborn. Plantar fasciitis is in essence a soft tissue problem, but left untreated can develop into a heel spur, which is much more difficult to treat. Our biomechanical assessment clinic in Hamilton (near Glasgow) can help you with advice and treatment for plantar fasciitis. Within the clinic we will confirm the diganosis for you and also assess and advise how we could help address the pain and discomfort caused by Plantar fasciitis. How to treat the symptoms of Plantar fasciitis? 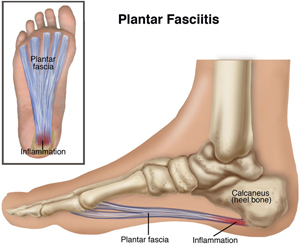 The symptoms of plantar fasciitis are related to the stresses and strains of the soft tissues in the foot on actvity. There are very often biomechanical issues which increases the likelihood of suffering with plantar fasciitis. It is important that a biomechanical assessment is undertaken by a qualified Orthotist or Podiatrist to establish the reason for your issues, and how we can treat the problem. From this assessment Orthotics (special insoles), stretches and strengthening of muscles and tendons are often prescribed. The orthotics would be used to protect the plantar fascia to allow healing and prevent further damage. A stringent stretching regime is often required as well as massage to help break up any scar issue from wear and tear would often be advised. Plantar fasciitis can sometimes also be treated with other approaches other than orthotics and stretching. Injection therapy can be used by using steroidal injections which can be effective in reducing the symptoms. Shockwave therapy is also used to help reduc the inflammation causing the pain. To find out more about biomechanical assessments and orthotics provided within our orthotics and biomechanics clinic at The Treatment Hub in Hamilton (near Glasgow), South Lanarkshire, click on the links below.